Please note that Plantdrive has discontinued the NADA controller listed below and only sells the VOControl now. I also have replaced the left switch in the picture with a 50amp switch as the one above was only rated at 30amps. The Vegtherm and line heaters ombined pull over that. Unless you use a relay (something I should have done), remember to use heavy wire suitable for 50amps. Also make sure your altenator can handle that level of power draw. As a general rule you shouldn't use more than 50% of altenator's rated power. My 2002 Jetta has a 90AMP altenator & I am using less than 45amps for the electric portion of the VO system. I 've since figured that there must be a better way to do this. I have 3 switches as pictured above. The left switch is used to turn the electric portion of the system - the Vegtherm and injection line heaters - on or off . This is something I wanted for the really hot days and once the the system gets going with the radiant heat it can maintain itself. Besides why tax the altenator if I don't have to? By default it is in the on position but is not energized until the main diesel/veggie switch is activated. This switch can be eleiminated by using a thermistatically controled sensor that turns the power off when the oil gets to a predetermined temerature. Plantdrive sells such an item, thereby eleminating the switch. 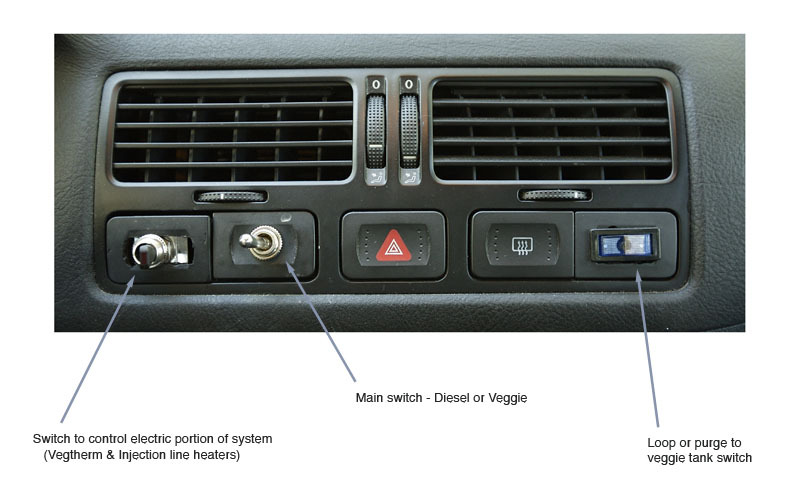 Maybe not a better way but another option would be adding a sensor that won't engage the 3 port valves or electrify the vegtherm until the engine gets up to temp. With that sensor installed you simply throw the diesel/veggie swicth at any time - imediately after starting the car if you want - because the circuit will not complete until the coolant fluid reaches a predetermined temp. I engage this switch to purge the veggie oil in the loop back to the veggie tank. Since my system uses a "looped" return while on veggie, any veggie in the loop portion of the line is returned to the diesel tank during the purge process. I have to manually engage it and wait a predetermined length of time - approx :20 seconds & then switch it off. If I forget to turn it off (I haven't yet) it will drain the diesel tank - it's only a 4.5g tank. I better way would be some sort of timer relay that would stay on for a predetermined amount of time and then shut off. So I wouldn't have to worry about it draining the tank. It may even be possible for it to engage when I switch back from oil to diesel using the middle switch.